by Miller, J. Mitchell; Schreck, Christopher J.; Tewksbury, Richard; Barnes, J.C. This concise, up-to-date text provides student-friendly examples of all theoretical approaches that emphasize the complex relationships between 21st century social structures, cultures, and crime. 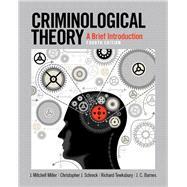 Criminological Theory: A Brief Introduction, 4e provides students and instructors with a concise, up-to-date, and thorough discussion and explication of major criminological schools of thought. The text focuses on providing students with understandings of not only what the central tenets are of criminological theories but also focuses on providing real-life examples and implications for criminal justice policy and practice. The various theories examined across the chapters are illustrated through examples drawing upon contemporary cultural developments of particular interest to college age students that increase interest and engagement.